The church’s holdings included the Washington Times newspaper; Connecticut’s Bridgeport University; the New Yorker Hotel, a midtown Manhattan art deco landmark, and a seafood distribution firm that supplies sushi to Japanese restaurants across the U.S. It acquired a ski resort, a professional football team and other businesses in South Korea. It also operates a foreign-owned luxury hotel in North Korea and jointly operates a fledgling North Korean automaker. All in all, Moon didn’t do badly for a man who was sent to complete Christ’s work on Earth. 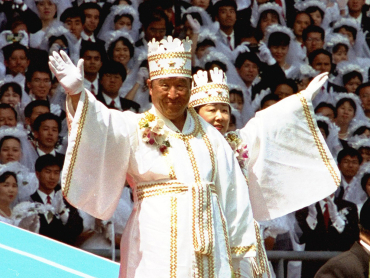 In 1991, Moon traveled to North Korea to meet with Kim Il Sung, who was himself a messiah of sorts. The two of them got along famously, no doubt because they had so much in common. Imagine Jesus and Mohammed meeting at a barbecue and talking shop. It must have been something like that. When I was young, I attended a college in Boston. The place was lousy with Moonies. They had an office across the street from the campus. They were always trying to recruit people. One day, while I was sitting in the cafeteria eating lunch, a young East Asian man came up to me and started giving me the Moonie spiel. He talked about how corrupt our society is and how we need to do something about it. I finally got irritated, and I said to him, “If that’s the way you feel, why don’t you go back to your own country.” That was not a good thing to say, I admit. The guy had a humorless, monomaniacal air about him. Later on in my life, I would meet members of sectarian left groups who had that same quality about them. Still, I would argue that Moon didn’t do nearly as much harm as Mitt Romney and his Bain Capital did. The worst that Moon did was make people take part in mass weddings that everyone else thought were creepy. I know a guy whose parents were married in one of these ceremonies, and he seems pretty normal. (Well, to me, any way.) Whereas Bain put people out of work and destroyed whole communities. This entry was posted on September 3, 2012 at 7:28 am and is filed under Capitalism, Korea, Religion. You can follow any responses to this entry through the RSS 2.0 feed. You can leave a response, or trackback from your own site.